The Chennaiyin FC U-13 team beat Mahogany FC 8-0 in an U-13 Youth League match at the SSN College Ground today. Strikers K. Suriya and Mohamed Liyaakath scored four goals and three goals respectively with captain Rahul K. also netting once in what was another dominant Chennaiyin display. 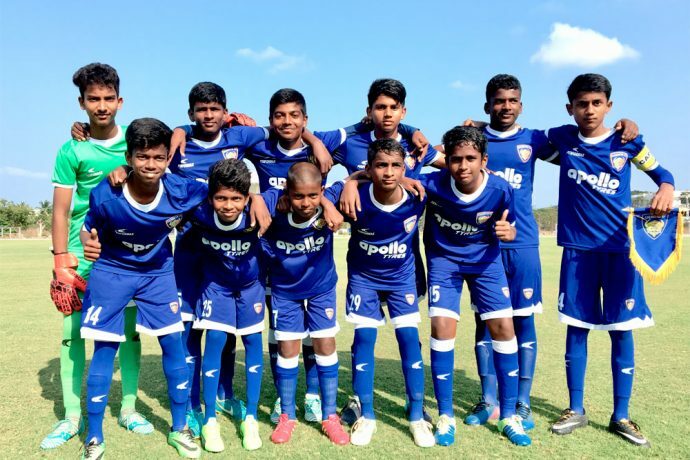 The CFC U-13s will now face Football Plus in their final group match on February 19, 2018 at the SSN College Ground, needing a draw to win the Chennai zone and qualify for the final round. Fresh from a 9-1 thumping of Chennai City FC in their previous game, Chennaiyin were on the attack from the word go. And the opening goal arrived in the 13th minute, a well-taken free-kick by Mohamed Liyaakath after a foul outside the area. His strike partner K. Suriya too got into the act a few minutes later and made it 2-0, before CFC captain Rahul K. found the back of the net on the stroke of half-time to put his side three goals to the good. Liyaakath then scored two goals in two minutes after the restart to complete his hat-trick, continuing his fine form in front of goal, having put four past Chennai City FC in the last outing. It didn’t take too long for the CFC U-13s to make it 6-0 as K. Suriya completed his brace five minutes later. And there was no stopping Suriya in the closing stages as he netted twice in the last ten minutes to make it 8-0 and take his personal tally to four goals for the afternoon. CFC thus completed the double over Mahogany FC, having beaten them 6-0 in the reverse fixture on December 30, 2017.